What is the IICRC, and Why Should I Care? IICRC is a certification from the Institute of Inspection Cleaning and Restoration. A mouthful, yes, and I can hear you yawning already. I know it’s not the most exciting name on the planet! It’s not exactly the League of Extraordinary Gentleman, admittedly – although it could be considered the League of Extraordinary Technicians. Not much better, I know, but it’s closer to an explanation! The IICRC has a mission to identify and promote an international standard of care that establishes and maintains the health, safety and welfare of any built environment. It works with trade associations to develop consensus-based standards. This means that when you used an IICRC-certified technician to work on your home, you can rest easy knowing you are getting the best, most up-to-date cleaning and restoration methods currently known in the industry. In short, you are getting a bona fide expert. 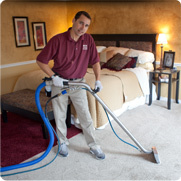 All BCS carpet cleaners are IICRC trained, which means they are not just good at sucking up dirt in lovely straight lines – they know the most current techniques, cleaning tools and chemicals to keep your carpets in the best condition they can possibly be in.